Tangy and delicious, this Mama’s Pasta Salad is a potluck and tailgate favorite. Enjoy the ease of preparation and makes enough to feed a crowd. I love a good pasta salad. In fact, I don’t know many people who don’t appreciate pasta salad served with their favorite burger or hot dog. 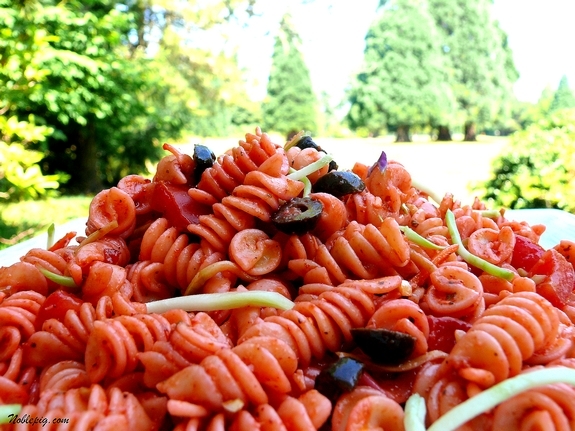 Pasta Salads are truly the epitome of a summer barbecue. It makes we wonder, are pasta salads just an American thing? I’d love to know. 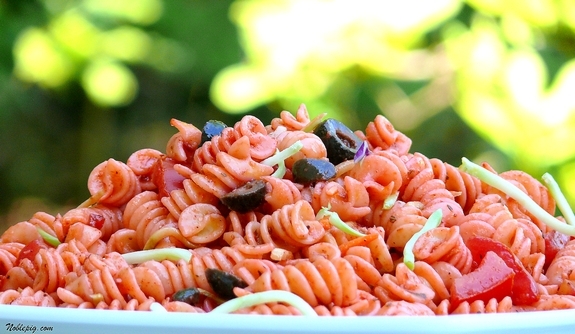 The color and zing of the sweet and tangy flavor of this Mama’s Pasta Salad will have your mouth watering for more. My husband and oldest son have always given this one the thumb’s up. It’s definitely one of my go-to recipes. My family also enjoys my Greek Pasta Salad and Pepperoni Pizza Pasta Salad is also a family favorite. Check out more mouthwatering ideas with these 15 Year-Round Pasta Salads. Perfect for all the summer barbecues still waiting to happen and all the tailgates still coming up. You are going to enjoy this one. 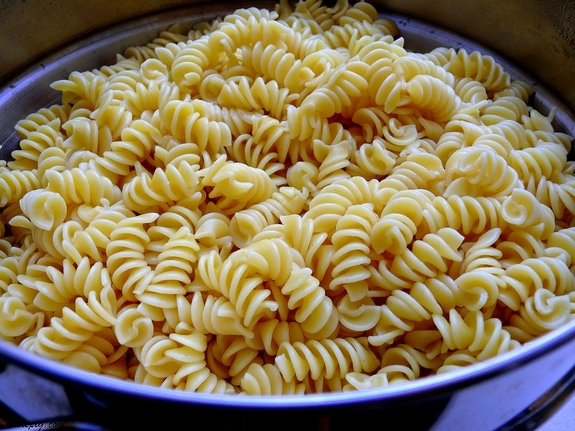 Prepare two pounds of rotini pasta according to package directions. Cool the pasta completely, stirring gently with your hands to keep the noodles from sticking together. 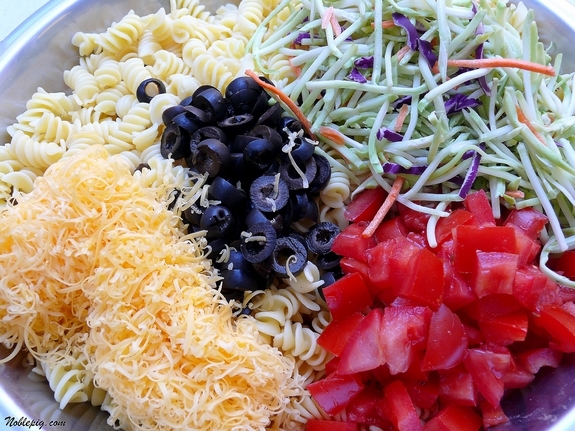 Once the pasta is completely cooled toss with extra sharp cheddar cheese, sliced olives, tomatoes and broccoli slaw. Mix the pasta mixture with 1/4 bottle of Kraft Catalina salad dressing and 3/4 bottle Kraft Sun-Dried Tomato Vinaigrette. Cover pasta and place in the fridge over night. (I put mine together early in the morning and by dinner time it was ready.) In a separate bowl combine the remaining dressings together and place in the refrigerator as well. After the overnight or day long chill, toss the pasta with the remaining dressing and serve cold. Or eat it alone, it’s delicious. Everyone loves a recipe passed down or made by their Mama. There are so many good ones out there. I surely wouldn’t mind a slice of Mama’s Mexican Cornbread or Mama’s Sweet Strawberry Cake. I would also never turn down a batch of Mama’s Buttermilk Biscuits and Mama’s Chicken Enchiladas also sound pretty darn amazing. Prepare 2 pounds of Rotini pasta according to package directions. Cool the pasta completely, stirring gently with your hands to keep the noodles from sticking together. Mix the pasta mixture with 1/4 bottle of Kraft Catalina salad dressing and 3/4 bottle Kraft Sun-Dried Tomato Vinaigrette. Cover pasta and place in the fridge over night. (I put mine together early in the morning and by dinner time it's ready.) In a separate bowl combine the remaining dressings together and place in the refrigerator as well. This is different alright. Mostly due to the dressing. Catalina’s one of those tangy, tasty dressings that has always been relegated to the world of leafy greens. Very interesting! And the cheddar and olives sounds like they would add another bit of bite as well. I love, love pasta salad & have seldom met one I didn’t like. I’ve been known to thrown in everything but the kitchen sink when making mine, so I’m really digging this one. And as always, your pictures are stunning. 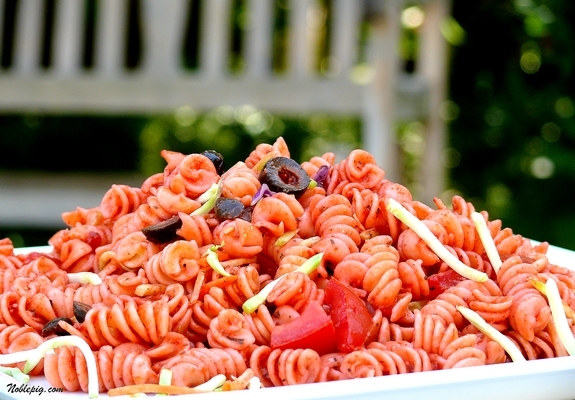 Is there anything better than pasta salad in the summer time? I think not. This looks wonderful, very different flavor I bet. But so pretty and colorful. Can I just tell you my security code wa 06969. Funny. my momma never made pasta salad, but I do enjoy pasta salad. this one looks very yummy. Catalina dressing, huh? It looks good and cool with the red look! Not Yo Mama’s–sounds like something from Paula Deen. Lovely! I wonder what a good substitute for the tomato would be…? I love the colors on that salad! 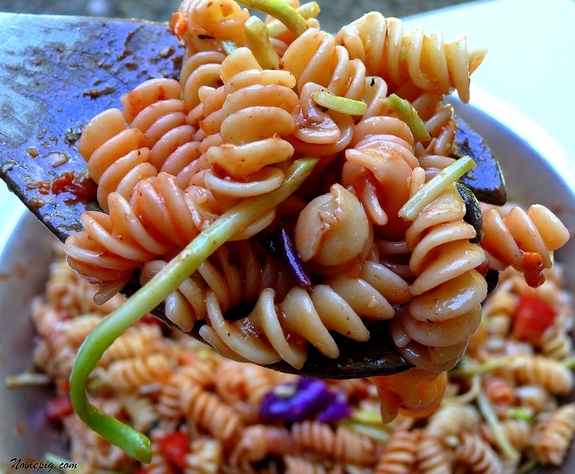 This recipe is different from any other pasta salad I’ve tried. It sounds really flavorful! Yes! Finally another recipe that will allow me to use the rest of that bottle of Catlaina dressing in my fridge. I thought this day would never come. Looks scrumptious! Looks delish and I love the color. I’ve always liked Kraft Catalina dressing so this will show up at one of our barbecues before too long. I’ll be right over. With a big bowl. Let me just say I am insanely jealous of where you get to photograph this beautiful food. The backdrops are unreal…those trees! This pasta takes on such a beautiful color! I like the idea of combining 2 dressings for this salad. You are right, it would be perfect for a BBQ! 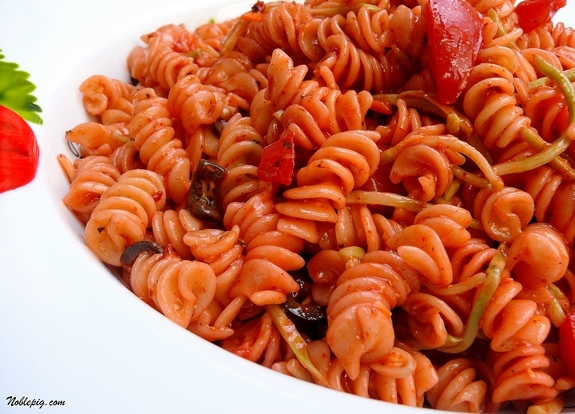 Never made pasta salad before, this one of yours look really delicious. Oh this is perfect! I was looking for a dish to take to a potluck and I can easily do this. I have everything already on hand! Yay! Oh my, that looks great. I love a good pasta salad. I love pasta salad and that looks like a good one! 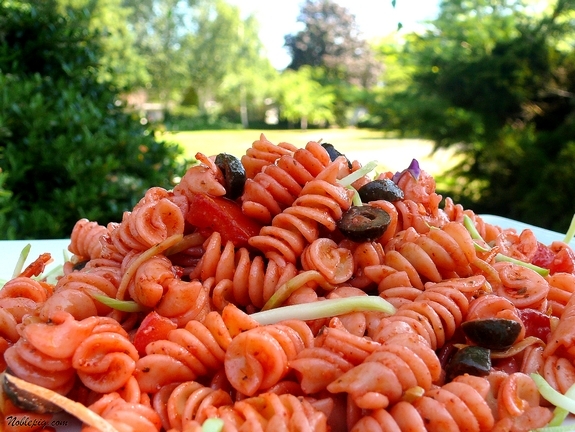 Pasta salads are such a nice addition to a summer menu. Love the name of this dish! It is hot enough today to be a pasta salad and veggie night!! This sounds so delish. This does look good, and would be excellent served with the sliders!Outside on your deck overlooking the Willamette Valley and Pinot country! That makes a ton of pasta salad. Looks good. Mmmm that sounds great! I could use a change from my macaroni salad…even though it’s delish if I do say so myself! LOL! I think the guys in my house would also give this salad a thumb’s up! I’m always looking for new pasta salad ideas. I never would have thought to add the broccoli slaw to a salad. I can’t wait to try it. Bookmarking now! My mouth is watering…..that looks so yummy!!!! I will give this a try as soon as I weigh in at Weight Watcher’s tonight…. I just printed this out and after my trip to the store this pasta will be on my table for dinner. That looks great…I love both those types of salad dressing. I’ll bet they’re wonderful on there. I would never have thought to use Kraft salad dressing in a pasta salad…but it looks good. That’s a nice recipe that you received from your reader. Love your pics. I’m guessing the salad dressings give it the red color. It sounds really tasty, especially with summer barbecue. My grandmother used to always serve it on her iceberg salads! It was such a treat. Thanks for reminding me! I’ll be having this with the pork chops! Very interesting recipe indeed! The sauce sounds wonderful and it looks so appetising! I added more cheese and crumbled bacon like the last post mentioned and also more olives…this pasta salad is sooooo good and a nice change from the usual italian style. Thanks for the recipe! A+! Here in Australia I have never seen Catalina dressing, what exactly is it made out of, what could I use instead? I’m not sure what the comparable product in Australia would be but here is the link to the recipe for Catalina dressing. I tried this salad to great success. The only change I made was to add a little shiracha chili sauce. OMG ! people were begging for the recipe ! Thank you for this great salad. Yes…were going to a BBQ this 4th and Im making your Chocolate Guinness Doughnuts with Bourbon Cream Glaze and Bacon to take with us…. ….Oh yeah…..Happy 4th of July ! It would be nice if the size of bottles of dressing were included in the recipe. I know the recipe said it did not use the 2 bottles of the one dressing, but that doesn’t help a lot. The picture looks fantastic and would not want to ruin it. I make this all the time. I love it. I leave out the olives – not my thing, and I use a can of Aylmer accents garlic and olive oil diced tomatoes instead of chopped tomatoes. I also cook 4-5 boneless and skinless chicken breasts that I cut into small cubes that I cook with BBQ sauce, sriracha sauce (add to suit your spice tolerance) , onion salt or powder, and some garlic salt or powder, and salt and pepper. I add the remaining sauce to the Catalina and Sun Dried Tomato & Oregano – I can’t seem to find just the vinaigrette, so I’m not sure how much it changes the flavor, but it still seems pretty good to me. Sounds like it’s perfect for you!